Sean O'Rourke took the record for all 15 down to 2d14h3m, Aug. 1-3, 2012. Andrea Sansone has the women's FKT (accompanied) of 7d11h22m, July 26 - August 2, 2017. Sam Skrocke enchained all 15 CA 14ers on foot and bike in 9d20h41m, July 29 - August 7, 2014. 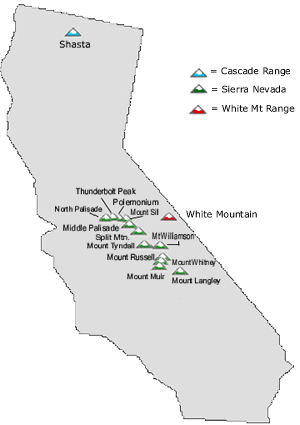 California has 15 peaks over 14,000 feet, the so-called "14ers". Previously, efforts to bag all the peaks were hampered by the fact that the second highest, Mount Williamson, was closed much of the year (July 16 - December 14) to protect Bighorn Sheep. Climbing Williamson, which is close to Tyndall, adds a few hours. Some record-seekers (Florine, McBride) chose to respect the closure, and climb only the 14 "legal" 14ers, while others (McBroom, Swartz) have ignored the rule, tagging all 15 peaks. However, the closure has recently been lifted. An additional difficulty for those aspiring to bag all the California 14ers is the technical nature of the five peaks known as the Palisades. Because of this, all successful records have been done by people capable of comfortably free-soloing mid-5th class rock in a very remote, high alpine setting. The CA 14ers are not the domain of pure ultrarunners! Climbing the CA 14ers has largely not been complicated by the somewhat arbitary "rules" set for the Colorado 14ers. All the CA 14ers have clear trail heads well lower than the summits, and most are long approaches. In August 1998, Hans Florine, Russ McBride and Tony Ralph kicked off California 14ers mania by climbing all 14 "legal" peaks in 9d10h50m, car-to-car. Their report is here. In August 2001, Josh Swartz crushed the earlier record, climbing all 15 peaks in a 5d23h41m, car-to-car. Josh's trip was solo and self-supported, particularly fine style. This appears to be the FKT for a self-supported trip. A year later, in August 2002, ultrarunner and adventure racer Jack McBroom lowered the mark for all 15 peaks to 4d11h19m. Jack had support during the effort, including with driving between the peaks, which is especially helpul on the long drive to Shasta. McBride made a failed attempt on the 14ers in August 2003 (Florine was supposed to participate in this trip, but became sick just prior and had to postpone). On his own trip, a month later (September 2003), Hans Florine bagged 14 14ers in 3d12h11m. Many more details of these trips are linked to Hans' site. These records stood for quite a while, until Sean O'Rourke climbed all 15 peaks in just 2d14h3m on August 1-3, 2012, as reported below. By this time, Williamson was legal year-round. O'Rourke had driving support during his trip, and slept during the car shuttles between peaks. His splits and a link to his trip report are below. Speed attempts on the CA 14ers by a women have been rare, and so far have been accompanied by men. In July 2006 Jacqueline Florine climbed the 14 then-legal 14ers in 9d12h17m. 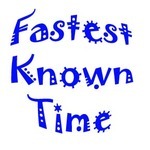 In late July 2012 Maggie Crawford attempted the FKT, but was stopped by giardia. Recently, Andrea Sansone who climbed all 15 CA 14ers in 7d11h22m, July 26 - August 2, 2017. Sansone was accompanied by Andrew Hamilton, who holds the FKT for the CO 14ers. The trip was tracked on 14ers.com. Professional climbers Alex Honnold and Cedar Wright enchained all 15 CA 14ers on foot and bike in about 22 days, June 19 - July 10, 2013. A brief write-up is here. epictv.com has a series of (8) videos on the trip. The pair of top rock climbers did many of the peaks by free soloing hard technical routes, but appeared to have more trouble with the biking sections. Sam Skrocke recently crushed this time, doing the self-powered CA 14ers in just 9d20h41m (self-supported), July 29 - August 7, 2014, as reported below. Don't forget, the unofficial or official rules say you must stay on the ground through the duration of a record attempt. Hans flew from Lone Pine to Mt. Shasta. Jack McBroom did the 10 hour drive in an old 4x4 Toyota "four banger" pick-up. As of 2011, I understand it is now legal to climb Mt Williams year round. Maybe Hans should give it another try, without an army of support and an airplane. I just finished a run of the 14ers yesterday in 62h3m; my split for the Sierra 14ers (the interesting part IMHO) was 40 hours. I used Hans Florine's 4-leg approach (South Lake to Red Lake, Cottonwood Lakes to Shepherd Pass, White Mountain, Shasta), but I climbed Williamson, put the two Sierra legs back-to-back, and only slept during the car shuttles. Other than the driving, I was completely self-supported, and went solo other than the walk up the road to White Mountain. Here is the trip report, including details on the route, food, photos, etc. A man I met going down Shepherd Pass took a short video, which he may post here. I recently completed climbing all(15) of California's fourteen thousand foot peaks in 9d20h41m. Here is a link to a full TR. Below is just the skinny version. I was completely self-supported and mostly unsupported: I used Goran Kropp’s purist ethics as I understood them from his book “Ultimate High”. I carried all my gear from start to finish. I carried all the food that I was going to need for the climbing and camping from the beginning. I did not take any help, food or other items from anyone. The only thing I did not carry with me was the meals I would require during the bike riding portion of this trip, which I purchased from restaurants along the way. I did carry all supplementary food for the bike from the start. I ate Mountain House meals with dehydrated potato flakes, to beef them up a bit, for my meals. I carried with me 500 calories worth of product each day in the form of Natures Bakery Fig Bars, PowerBar Gel Blasts and PowerBar Energy Waffers. Strong work! I look forward to reading the TR in detail. Amazing trip--more risky free solo climbing that I'm capable of! Congratulations! Amazing is right. Sam, do you remember seeing two runners just coming off the summit of Whitney as you were making your way up? That was me and my buddy and I'm pretty sure it was you running up the summit since it was just after 1pm on 8/7. If that was you, man you were looking strong! Oh yeah! Seeing you two running down from Whitney was awesome! I loved seeing some kindred souls up there I was feeding off your energy that's probably why I was looking strong. What an incredible day, We were psyched! You say you were 100% self supported / unsupported, yet you admit in this forum that you were "feeding" off of other people's energy. Sounds up for debate to me! But for real, this is one of the coolest challenges I've heard of accomplished. Amazingly strong work Sam. Does anyone happen to know where I might be able to find more information about fkt's on the fourteener's individually? I was curious about female fkt's on some of them, but I haven't really been able to find much. Everything I've found seems to be about completing all of them back to back. Just curious. I'd love help with the info though. So far I only know of individual FKTs for Shasta and Whitney. For some reason, mountain FKTs by females seem to be rare, and I don't have record of any on these peaks. Go get it! is a FKT self-supported not recognized as a "true FKT" ? I see that the FKT from Josh Swartz is not among the bold one on top. It is the "true" self supported FKT. As a mountaineer I would like to address Peter's comment about the "style" expected by mountaineers and climbers for a record like this. I find Peter's description of the women's "style" quite uninformed! Those comments are so unnecessary it basically comes off as a sneaky way of disparaging their efforts. Let me tell you about the kind of effort that Andrea put in and her "style". The truth is neither Andrea nor I are capable of free-soloing the summits of Sunlight Peak or Thunderbolt, nor would I argue are most non-climbers. So we aided the hell out of those summit blocks. As mountaineers and not climbers, we don't really care about who free-solos what. We will scrap, scrounge, and do whatever ungraceful thing is necessary to get to the top. I might mention too that not only did Andrea stand on top of Starlight, she held the standing splits pose up there when I couldn't even stand up straight! We had to climb pretty much everything else unroped (except rappels) in the interest of time. Those two summit blocks are such a minor part of the effort anyway. We literally spent days on class 4 and 5 scrambling with heavy packs at nearly 30 pounds each. The mental drain of being in such exposed positions for days with packs and ice axes conspiring to knock you off your tenuous holds is mentally quite difficult to deal with. Especially to someone like Andrea who has not spent a great deal of time in terrain like that. Now that is what I call "style"! Peter, I invite you to head over and try the routes we did before you disparage Andrea and Jackie's efforts! Why don't you go follow Andrea and my route...then come back and talk about style. You might then really appreciate, like Andrea and I, how amazing all those California 14er record attempts have been! It is possible to appreciate the efforts of the men without putting down the women. I'm baffled by your response to what I have written above. I can't for the life of me see how it disparages the women involved. Nor do I see how it is relevant whether I or anyone else could solo those routes. The point is that it is standard in climbing that if someone claims a route they lead the pitches. You can claim a route as a team, and alternate leads. But, here Andrea is claiming the women's record and you are not claiming a record. How should I describe that in terms of style? I guess I could say you both have the record for a mixed-gender team? Which record is she claiming? It's not a matter of disparaging, it's a matter of being accurate about what was done. Every sport on earth keeps different records for men and women. In competitive running, for example, it is no longer valid to have male rabbits for female competitors. So, I ask you, what record should Andrea be credited with? This is a practical question - I'm not interested in disparaging anyone.